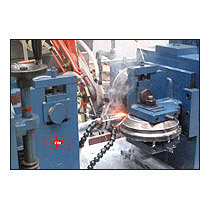 High Frequency Solid State Pipe Welder uses the common structure of frequency conversion such as AC-DC-AC. Three phase 380V power supply is sent to step down transformer before it passes through switch cabinet. The AC power supply is around 200V whose voltage is dropped to send into the rectifier in rectifier cabinet. Rectifier use three phase thyristor fully controlled bridge rectifier. The rectified DC voltage is sent to the high frequency inverter before passing through the filter link. High frequency inverter to inverter producing single phase high frequency is sent to resonance circuit via the matching of load and the adjusting mechanism output high frequency energy to complete steel pipe welding. The High Frequency Solid State Pipe Welder equipment quality and the operation stability have been accepted by the general welding pipe enterprises. © Copyright 2012. Nirmal Overseas Ltd.